LB576, sponsored by Gordon Sen. Tom Brewer, is intended to curb increases in property taxes. Brewer brought an amendment to the hearing that would replace the bill. Under the amendment, a property’s assessed value on Jan. 1, 2019, would be the same as its assessed value on Jan. 1, 2018, plus the cost of any improvements made during the year and minus the assessed value of any improvements that were removed. The same valuation method would be used each year through Jan. 1, 2022. Brewer said many Nebraskans feel that the Legislature is not doing enough to reduce high property taxes. LB576 would force lawmakers to resolve the problem in the next two years, before the bill’s four-year cap on valuations begins, he said. “My bill doesn’t lower property tax, but it does make every other idea designed to do so a lot easier to implement if the body understands that the clock is ticking on this issue,” Brewer said. Doug Kagan of Nebraska Taxpayers for Freedom testified in support of the bill, saying that the state’s current property valuation system is archaic and needs updating. 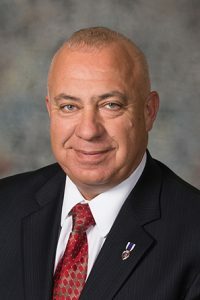 Kagan said LB576 would send a message to county assessors and local taxing authorities that the Legislature is serious about stopping valuation spikes like those seen in recent years. “We believe that LB576 will provide a cooling-off period for this escalation and offer the Unicameral sufficient time to legislate comprehensive property valuation reform,” he said. John Chatelain of the Metropolitan Omaha Property Owners Association also testified in support of the bill, saying that real estate valuations in Nebraska are out of control. He said higher property taxes force landlords to raise rents on tenants. Nathan Habel of Lincoln also testified in support. He said he could give the bill tepid approval because it could start the process of addressing chronic problems with the state’s property tax system. However, he added, it only would freeze valuations at their 2018 level, not lower them. Frank Weberg of Wausa also testified in support of LB576. Weberg, whose company sells farmland and manages land for absentee owners, said declining commodity and livestock prices, combined with high valuations on agricultural land, make it difficult for owners to pay their property taxes. For example, he said, the property taxes on a 240-acre tract the company manages are nearly 30 percent of the owner’s rental income. “We’re not suggesting anything at this time besides asking you to pass LB576 and give yourselves time to come up with a more equitable real estate taxing system,” Weberg said. Testifying in opposition to the bill was Christy Abraham of the League of Nebraska Municipalities. She said municipalities often see increased expenses, such as rising health care costs or aging infrastructure, that are beyond their control. LB576 could force them to cut services such as public parks, libraries and swimming pools or look for other sources of revenue. “If property taxes were frozen, cities may need to look at shifting some of their taxes to other things such as occupation and sales taxes,” Abraham said. Jack Cheloha, a lobbyist for the city of Omaha, also testified in opposition. Cheloha said the city faces rising costs for wages, health care and even the price of asphalt used to fill potholes. Freezing valuations could force the city to cut jobs and public services, he said.